If you have been fishing for a while and you haven’t got any bites, one of the few things you can do is change your rig. Think about the type of bait that you are using. Whether it’s stock trout or a rainbow trout, I will always go with a PowerBait setup. Only the best powerbait for stocked trout can get the fish you have been yarning to land. Which trout bait works better? In this article, we are going to go through different PowerBait setups and see which one hooks more trout. I really prefer the Corn PowerBait from Berkley. 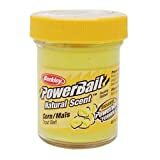 This is my all-time favorite power bait because it works very well and it’s very bright. This fish can see it easily, and a lot of times these fish are feeding off sight. The main reason is probably that it is corn flavored and smells the same. We all know trout love corn. Nothing is better than sipping a cold drink, relaxing on the shoreline and let the bait do all the hard work. Yep, they work pretty well. In fact, the Best PowerBait For Trout Fishing can replicate the closest thing to what hatchery owners feed them. Just make sure you don’t use them for “catch and release.” Once a trout swallows the bait, the fish is a done deal. A PowerBait will work the best if you find the right color and scent. There are a lot of variations to choose from, and each of them has their own specialty. The main problem I’ve found is that they don’t work well when moving. If you are just fishing in a pond, or a nice little stream or a lake, they should work well. Add weight above the hook with a bobber to let the bait sink, or you can fish it on the bottom. A simple trick is to find a spot where trout are usually biting and hitting the same spot over and over again. There is something under that spot that trout like and that’s why they will hang around at that spot. Find the right depth and target them with floats. I have a friend named Trevor who specializes is bait fishing. He once told me that you could never have enough PowerBait. Since there are a wide variety of colors and types, it is better to try out different variations and see which one works best for you. Also, it’s better to use a lighter line and don’t use anything that is heavier than a 4-pound test. Power bait is a great bait for trout especially in areas that have current breaks. Have a look at some of the best trout powerbait that will increase your catch rate. Trout can sometimes be picky. You need the right color and the right scent to attract them. For my first choice, I’ve picked the Corn Yellow color because it’s bright and has corn flavored scent. And we all know trout love corn. It works great for catching stocked trout, and the best part of this is that you won’t catch any undesirable fish with power baits. Late in the year when trout won’t feed on anything else besides snails, this when artificial fish attractants like this come in handy. It is made using the highest quality materials that are engineered to catch more fish. It replicates the natural scent of corn and tastes like live bait. Which means the fish will be more eager to swallow the whole bait. The dough type bait is easy to use. Just take about half inch of bait using your finger and squeeze to make it into a tiny egg size shape. You can use a single line hook or a treble hook. Overall, it’s a quick surefire way to hook some stock or rainbow trout. A simple glitter can greatly reduce your catch rate. It’s the ideal bait for novice and professional anglers. It has an irresistible scent and flavor that make the fish hold onto the bait longer giving you enough time to feel the bites and reel in comfortably. Unlike the previous corn flavored bait, this one is digestible by trout. It has a similar look to that of what trout get fed in the hatchery. It’s an excellent bait for trout because the dough bait will easily get digested by the fish and pass through without hurting them. A small dough is enough to start hooking some trout. Make sure to have a proper rig before you start fishing. The extra addition of scent with the rainbow glitter is enough to get some bites early. It is highly recommended that you use a 4lb mono line with two split shots. Considering the effectiveness of this bait, I would say it is kind of cheating. No pun intended, but that’s how good this product is. It has all the natural ingredients of a trout bait that boost trout-attracting power. If you want to find the easiest way to catch trout, use Powerbait Trout Nuggets from Berkley. It is highly visible underwater, and its advanced scent dispersion can easily attract trout. If you can’t catch any fish with this bait, you better give up on fishing and look for another hobby. To get the most out of these trout nuggets, you better use a small hook that has the size of dough bait. Keep in mind that this bait floats above the sinker. As long as you use weight about 18-inch away, you can’t miss. You should cast right at the place where the fish can see or smell it. With this stuff, you don’t really need any experience trout fishing. The bait is also very easy to put on the hook. It has the same size as regular powerbait but with less mess. They also hold up pretty well under water. Since it is kind of rubbery, don’t cover the entire egg hook. If you cover the entire hook including the bard, you might sometimes miss a potential hookup because the barb will slide past the fish’s mouth. Just leave the barb exposed and cover most of the hook. 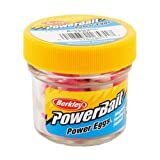 If you want a bait that floats, look no further than the PowerBait Eggs by Berkley. When you are not having any luck with other baits, this is the one that you should try next. Original scent with natural sized floating type bait that offers more natural presentation. The funny thing is, you can also use this to catch perch and bass. I know it’s not what you are looking for, but it’s good to know. There are 11 different colors and flavors to choose from. Pick a color depending on where you will be fishing. Trout really love power bait eggs. Especially in the morning when you are not getting any bites, these eggs can make fishing much easier. Unlike traditional plastic eggs, they have the added benefit of a scent that attracts trout quickly. It’s also a great bait to choose because of its no mess, hassle-free rigging. Once you start using them, you won’t go back to using ordinary baits. If you are looking to catch some steelhead trout, you can use these eggs for drift fishing on fast-moving rivers. 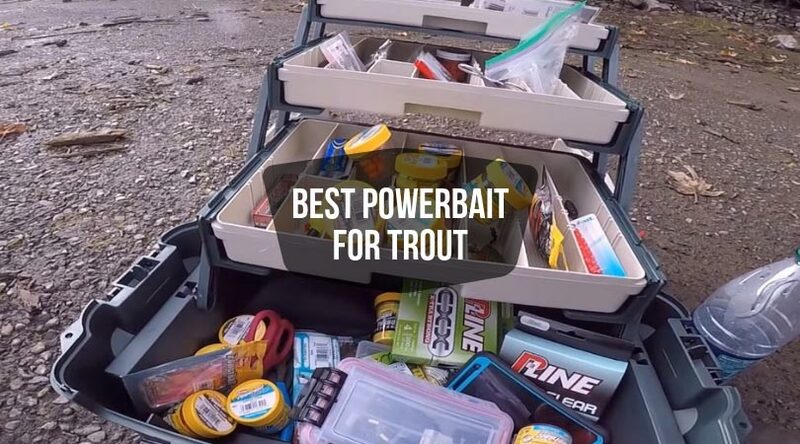 What Is the Best Powerbait For Trout & Why? 1. On clear, calm days plain yellow corn flavored baits are very effective because there will take a lot of light penetrating the water column. 2. On cloudy days where the water is stained with light algae blooms, Chartreuse is best. 3. An all-around good color on windy days with the sun on top is Orange. It can stand out against the changing wavelengths that occur from wind waves. 4. The best all-around color is probably Rainbow. You can literally use it on any weather condition. It is also one of the heavily used Powerbait color among anglers. Other than the water/weather condition, there are other factors that can also make a big difference. Line size, bait size, location, hook size and leader length is something that you should keep in mind. Even if you use the best powerbait for trout fishing, it won’t make any difference unless you get your setup right. For starters, use the lightest fishing line you can find and feel comfortable with. For me, I would always go with a 4lb main line with a 2-3lb leader line. As for the hook, go with the smallest treble hook you can find for your bait as possible. Don’t make the baitball larger than the size of a blueberry. If you are experiencing slow fishing with a basic 14–16″ leader, drop down to a down to a 6–10″ leader as it can get fish close to bottom biting. On a few attempts, if you bring up slimy algae or grass, try adding a new leader with 12” of length.